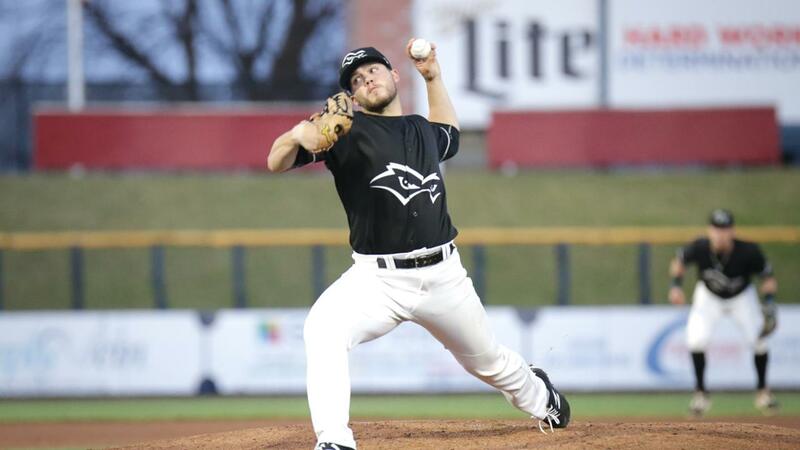 The pitching staff of the Quad Cities River Bandits matched their season-high for strikeouts in a nine-inning game with 18 as the Bandits evened their series with the Clinton LumberKings courtesy of a 7-4 victory on Thursday night at Ashford University Field. The Bandits also recorded 18 strikeouts on July 6 against Burlington. The Bandits took their first lead of the series by scoring an unearned run in the second inning. Scott Schreiber opened the inning by striking out on a pitch in the dirt. He hustled towards first and when the throw from the catcher Juan Camacho sailed into right field, Schreiber raced all the way into third. Alfredo Angarita scored him immediately with a bouncer to the first baseman and the Bandits took a 1-0 advantage. In the third, Clinton jumped in front with a crooked number against Bandits starter Edgardo Sandoval. Billy Cooke opened the frame with a single and moved to second on another base hit from Joseph Rosa. A walk to Keegan McGovern helped the LumberKings load the bases. Sandoval bounced a wild pitch in the dirt that allowed Cooke to score from third to tie the score. Onil Pena put Clinton ahead two pitches later by ripping a two-RBI double to deep right field. It didn't take long for the Bandits to answer back and regain the lead. Alex McKenna and Chandler Taylor opened the fourth inning with singles. Scott Schreiber drove both of them in with his three-run home run to left field that put the Bandits ahead 4-3. The long ball was Schreiber's sixth of the season. Quad Cities added to their lead in the fifth and sixth innings. In the former, McKenna ripped a triple off of the wall in right field to score Jonathan Lacroix from first and make it 5-3. Schreiber and Angarita led off the sixth inning with singles to place men on the corners with no outs. Miguelangel Sierra hit a bouncer to short that was misplayed by Johnny Adams for an error which scored another run and made it 6-3. Trey Dawson increased the margin by one more run by lining an RBI single up the middle in the next at bat. Clinton scored the final run of the evening against JP France in the sixth. Connor Hoover and Adams opened up the frame with consecutive singles and then catcher Juan Camacho drove a sacrifice to center field to close the gap to 7-4 which also represented the final score. Sandoval lasted 3.1 innings, allowing three runs on six hits with six strikeouts. Hansel Paulino worked 1.2 scoreless innings and punched out three to grab the win. France allowed just the one run on two hits and fanned four in 2.0 innings. The save went to Parker Mushinski who worked 2.0 prefect innings and struck out five along the way. The River Bandits offensive attack was paced by Lacroix who went 3-4 with a triple. McKenna, Taylor and Schreiber each added two hits. The River Bandits (37-29, 77-59) will close out their season-series with Clinton (28-38, 67-69) on Friday night at 6:30 p.m. The Bandits will turn to RHP Chad Donato (5-0, 2.26) on the hill against a Clinton pitcher that has yet to be announced.